The Herodian kingdom of Judea was a client state of the Roman Republic from 37 BCE, when Herod the Great was appointed "King of the Jews" by the Roman Senate. When Herod died in 4 BCE, the kingdom was divided among his sons into the Herodian Tetrarchy. The first intervention of Rome in the region dates from 63 BCE, following the end of the Third Mithridatic War, when Rome created the province of Syria. After the defeat of Mithridates VI of Pontus, Pompey (Pompey the Great) sacked Jerusalem in 63 BCE. 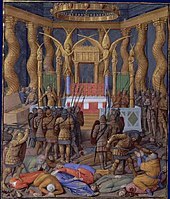 The Hasmonean Queen, Salome Alexandra, had recently died and her sons, Hyrcanus II and Aristobulus II, turned against each other in a civil war. In 63 BCE, Aristobulus was besieged in Jerusalem by his brother's armies. He sent an envoy to Marcus Aemilius Scaurus, Pompey's representative in the area. Aristobulus offered a massive bribe to be rescued, which Pompey promptly accepted. Afterwards, Aristobulus accused Scaurus of extortion. Since Scaurus was Pompey's brother in law and protégée, the general retaliated by putting Hyrcanus in charge of the kingdom as Prince and High Priest. When Pompey was defeated by Julius Caesar, Hyrcanus was succeeded by his courtier Antipater the Idumaean, also known as Antipas, as the first Roman Procurator. In 57–55 BCE, Aulus Gabinius, proconsul of Syria, split the former Hasmonean Kingdom into five districts of Sanhedrin/Synedrion (councils of law). "Antigonus... roused the Parthians to invade Syria and Palestine, [and] the Jews eagerly rose in support of the scion of the Maccabean house, and drove out the hated Idumeans with their puppet Jewish king. The struggle between the people and the Romans had begun in earnest, and though Antigonus, when placed on the throne by the Parthians, proceeded to spoil and harry the Jews, rejoicing at the restoration of the Hasmonean line, thought a new era of independence had come. When Phasael and Hyrcanus II set out on an embassy to the Parthians, the Parthians instead captured them. Antigonus, who was present, cut off Hyrcanus's ears to make him unsuitable for the High Priesthood, while Phasael was put to death. Antigonus, whose Hebrew name was Mattathias, bore the double title of king and High Priest for only three years. He had not disposed of Herod, who fled into exile and sought the support of Mark Antony. Herod was designated "King of the Jews" by the Roman Senate in 40 BCE: Antony "then resolved to get [Herod] made king of the Jews...[and] told [the Senate] that it was for their advantage in the Parthian war that Herod should be king; so they all gave their votes for it. And when the senate was separated, Antony and Caesar [Augustus] went out, with Herod between them; while the consul and the rest of the magistrates went before them, in order to offer sacrifices [to the Roman gods], and to lay the decree in the Capitol. Antony also made a feast for Herod on the first day of his reign." The struggle thereafter lasted for some years, as the main Roman forces were occupied with defeating the Parthians and had few additional resources to use to support Herod. After the Parthian defeat, Herod was victorious over his rival in 37 BCE. Antigonus was delivered to Antony and executed shortly thereafter, bringing about the end of the Hasmonean rule over Israel. King Herod has become known among the archaeologists as Herod the Builder, and under his reign Judea experienced an unprecedented construction, still obtaining an impact on the landscape of the region. Under his enterprise, such projects as the Masada fortress, the Herodion and the great port of Caesarea Maritima were built. During King Herod's reign, the last male representatives of the Hasmoneans were eliminated, while only Herodias remained alive with her daughter. Herodias was among the few remaining Hasmonean female heirs, as she was granddaughter of Aristobulus IV. Herodias was great-granddaughter of the Hasmonean princess Mariamne. Mariamne was ultimately convicted on dubious charges that arose from palace intrigue and internal power struggles. She was executed in 29 BCE, but was survived by her granddaughter Herodias and her great-granddaughter. Herodias managed to survive miraculously, and was eventually exiled to Gaul, with her second husband, Herod Antipas. Antipas was accused by his nephew Agrippa I of conspiracy against the new Roman emperor Caligula, who sent him into exile in Gaul, where he was accompanied by Herodias, a female Hasmonean heir. Antigonus was not, however, the last male Hasmonean; Aristobulus III, grandson of Aristobulus II through his elder son Alexander, and brother of the Hasmonean princess Mariamne, was briefly made high priest, but was soon executed (36 BCE) due to jealousy of Herod's first wife Doris. His sister, Mariamne was married to Herod, but fell victim to his notorious fear of being assassinated. Her sons by Herod, Aristobulus IV and Alexander, were in their adulthood also executed by their father, but not before Aristobulus IV having sired Herodias. The later Herodian rulers Agrippa I and Agrippa II both had Hasmonean blood, as Agrippa I's father was Aristobulus IV, son of Herod by Mariamne I, but they were not direct male descendants, and thus not seen legitimate rulers by much of the Jewish population. Herod died in 4 BCE, and his kingdom was divided among his sons, who became tetrarchs ("rulers of a quarter part"). One of these quarters was Judea corresponding to the region of the ancient Kingdom of Judah. Herod's son Herod Archelaus, ruled Judea so badly that he was dismissed in 6 CE by the Roman emperor Augustus, who appointed Quirinius to exercise direct Roman rule after an appeal from Herod Archelaus' own population, thus was formed the Province of Judea. Another, Herod Antipas, ruled as tetrarch of Galilee and Perea from 4 BCE to 39 CE, being then dismissed by Caligula. ^ Samuel Rocca (30 March 2015). Herod's Judaea: A Mediterranean State in the Classic World. Wipf and Stock Publishers. ISBN 978-1-4982-2454-3. ^ Jewish War 1.14.4: Mark Antony " ...then resolved to get him made king of the Jews ... told them that it was for their advantage in the Parthian war that Herod should be king; so they all gave their votes for it. And when the senate was separated, Antony and Caesar went out, with Herod between them; while the consul and the rest of the magistrates went before them, in order to offer sacrifices [to the Roman gods], and to lay the decree in the Capitol. Antony also made a feast for Herod on the first day of his reign." ^ Antiquities of the Jews 14.5.4: "And when he had ordained five councils (συνέδρια), he distributed the nation into the same number of parts. So these councils governed the people; the first was at Jerusalem, the second at Gadara, the third at Amathus, the fourth at Jericho, and the fifth at Sepphoris in Galilee." Jewish Encyclopedia: Sanhedrin: "Josephus uses συνέδριον for the first time in connection with the decree of the Roman governor of Syria, Gabinius (57 BCE), who abolished the constitution and the then existing form of government of Palestine and divided the country into five provinces, at the head of each of which a sanhedrin was placed ("Ant." xiv. 5, § 4)."